Pageant hairstyles are glamorous yet easy to do, for women, teens, and children alike. Today's styles do not differ much among the different age groups, though young girls can have more fun with accessories. The most popular styles are curls that can be easily flipped and twisted into an extravagant updo. Long, loose curls are popular among women and teens for pageant hairstyles, and do not require hairspray unless it is needed for flyaways at the side part. All that is needed for this style is a little moisturizing mousse and a large barrel curling iron. Work with larger chunks of hair rather than thin sections and do not brush after the hair is curled. Shake the hair from the scalp area with your fingers if the curls need to be broken up some. Naturally beautiful hair is what this style is all about and it is perfect for women or teens with shoulder length, straight hair. An off-center side part and a large round brush while blow drying is all this style needs to be picture perfect. The round brush will give you volume and the flip at the ends. Finish this style with a little texturizing cream or taffy to keep the ends from becoming flyaways. Curls are perfect for layered hair. This hairstyle would work well with shoulder length hair for women. Curl the hair with a medium barrel curling iron, about 3/4 inch to one inch diameter. Gently brush the root area of the top of the hair as the curls are brought back. Loosely pull back a section at a time and secure them with bobby pins at the back of the hair. The curls from the front hairline should be pulled back and sprayed into place using a firm hold hairspray. Leave two or three tendrils out at the front hairline. This goddess braid is an easy hairstyle for women or teens, but it can be tricky if hair extensions must be added. Pull all the hair into a ponytail at the crown. If hair needs to be added, this is when it should be done. Wrap the hair around the ponytail and divide it into two side sections for the braid. Make a basic three-strand braid. Fasten the ends with a small elastic. Wrap the braid around the ponytail to form a bun. Pin the braid in place with bobby pins. Smooth hair with a comb and finish with hairspray. This short, cropped cut is a perfect style for an athletic teen or woman in a beauty pageant. A great cut makes a great style. Ask your stylist for a longer version of a pixie cut that is tapered in the back and covers the ears. The top of the hair is cut layered toward the face. To achieve this style after the cut, straighten the hair if needed and use a little styling creme with your fingers to pull the hair toward your face. Finish it with hairspray if you desire. This is not your grandma's bun. It is an easy style for women or teens and takes very little time, but it looks quite elegant. Brush the hair back into a ponytail just below the crown. Leave a small section hanging down from the underside of the ponytail. Flip up the ponytail. Using bobby pins attached to a hair elastic, place one bobby pin behind the ponytail and pull the elastic across the ponytail. Secure another bobby pin behind the ponytail. Flip hair down and back brush the underside of the ponytail. Roll the hair hanging under using your hands. Secure with "U" shaped hair pins. Work from alternating sides to the middle securing the hair. Gently pull the sides over and secure with hair pins. Braid the small section of hair that was left out of the bun in a basic three-strand braid. Wrap braid around the bun. Tuck the ends underneath the bun and the start of the braid. Secure it with a bobby pin. Finish with hairspray smoothing any hair that may be out of place. Leave a couple of tendrils loose on each side of the face. Pull the rest of the hair up to the crown from the sides of the nape, leaving the hair at the center of the nape area hanging down. Pull up into a loose ponytail at the crown. Gently pull the curls so they cover the elastic of the ponytail. Pull the hair back into a sleek high ponytail. Using a large barrel curling iron, curl each piece individually. Place each piece as it is curled by securing it with a bobby pin at each bend of the curl. Use the top half of the ponytail for the top of the head and the bottom half for the nape area. Placing as you go will allow for pieces to be pulled through curls that are already pinned down. Finish the style with hairspray. Half up, half down curls are popular with teenage pageant contestants. This is an easy and elegant style that looks good whether you wear a tiara or not. Using hot rollers or a medium curling iron, curl all the hair in sections about two inches wide by one inch thick. For the bang area, curl the ends under but not all the way up. Brush the bangs to the side. Shake the curls to separate them. A light tease can be added to the crown area to give the hair a little height. Brush back the hair from just behind the ears to the center of the back of the head. Use bobby pins to secure the hair. Smooth any flyaway hairs down with a comb and lightly spray with hairspray. This is an easy pageant hairstyle for teens with wavy, shoulder length hair and is perfect for a second day style. It can also be achieved with a curling iron. If using a curling iron, curl the hair before styling it. Gather the hair with your fingers and twist it up on one side while letting pieces on the other side fall out. Secure the twist with bobby pins and hair from one side. Gently pull the ends of the hair to cover the bobby pins. Finish with hair spray if desired. This is an easy, cute look for toddlers, girls with short hair, or girls that dislike their hair being pulled up. Whether you curl the ends of the hair or not, a big bow on a headband is perfect for little girls, and will work with any cut, length, and style. Long ringlets are a very popular style among little girls in pageants. This look can be achieved two ways: with a curling iron or with foam spiral rollers. The rollers need to be put in damp hair and are soft enough they can be slept in. If that is not an option, place your little one under a hood dryer with some entertainment for half an hour. A curling iron can be even quicker. Work with small sections of hair and use foam spiral rollers or a skinny curling iron, about 1/4 to 1/2 inch diameter. Curl the pieces away from the face, and work from the bottom or underneath up to the top of the head. Do not shake the curls loose. If the come apart, use a little hairspray or texturizing creme on your fingertips and reshape the curls around your finger. When all the curls are made, use a comb to brush back a section and use a barrette or hair clip to secure the hair. Toddlers or little girls who do not like having their hair messed with will usually settle for a fancy headband. Bands that are made of elastic or have a loose plastic headband are more tolerable options for little ones. They can be adorned with little bows or jewels or flowers for an elegant but youthful appearance. This look works well with hair that is cut into a long bob or any style with bangs. Hair bands tend to stay on better and more comfortably with fine or medium hair thickness. Curl or straighten the back of the hair and straighten the bangs before putting the hair band on her head. 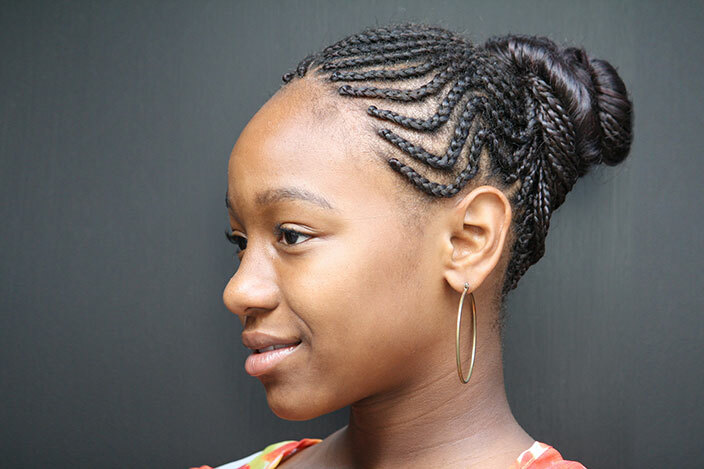 While this is a popular pageant style for little girls, teens can also wear this hairstyle. It works best on hair that is almost all one length. Curl the hair with a curling iron or hot rollers. If it's a little girl, you might consider foam rollers and a hood dryer. Use a comb or brush to pull the front of the hair up and back. This can be a little tricky if you have never done this. Brush the hair back as if you are putting a hair clip in it, then gently push the hair forward until you have the volume in the front where you would like it. Use bobby pins or a jeweled barrette to secure the hair. This is a great style for little girls, especially those with fine or curly hair. Add two satin flower bows to match her dress for the picture of perfection. Curl the hair and straighten the bangs if needed. Pull the top of each side into a small ponytail using a clear elastic. Place a flower bow on each ponytail to hide the elastic. While most pageant hairstyles work better with long hair, women and girls with short locks can opt for extensions, a chic and stylish cut, or hair accessories to change up their looks. Work with your natural hair texture for amazing results.